Synopsis, Our Opinion: It’s simply a STELLAR white wine. 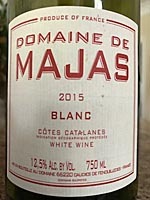 Producer/Winery: Agnès and Alain Carrere; Domaine de Majas; Caudies de Fenoulledes, France. Grape Variety: Blend – 45% Macabeu, 45% Rolle (Vermentino) and 10% Carignan blanc. Geographic Appellation, Region, Country: Côtes Catalanes; Languedoc Roussillon, France. Paired With: Seared scallops, basmati rice and peas. Chilled before drinking. Clear, wheat straw color. Peach, melon, citrus blosoms and freshly cut elephant garlic aromas with hints of phenolic resin (I’ve made a lot of carbon fiber car parts and you never forget that unique smell!!!). Smooth, very approachable, lively, light body and a 200-grit texture. Yeasty, not quite ripe melon, peach, lemon and limestone spring water taste. Citrusy crisp acidity and a long DRY MINERAL finish. WOW, what a FANTASTIC white wine. Fresh as a spring morning after a rain shower, flavors that were rich, zesty and complex and don’t get much better in a white wine, a strong mineral backbone that you could write home about and long dry finish that ties a great big bow around every sip. Needless to say this wine really tickled our fancy. Russ Anderson, owner, wine buyer and sales rep at the Caviste Wine Shop in Winston-Salem, North Carolina picked a winner with this one…he selected it for us and said he thought we would like it…and we really did. It’s simply a STELLAR white wine. Photo from Maya Pedersen, Louis/Dressner. 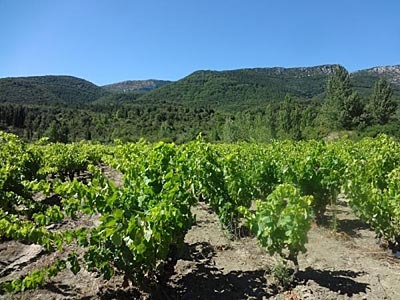 Comments: Learn more about Domaine de Majas and their wines (in French).